What Is a Henna Tattoo and Is It Safe for My Teen? Letting your teen get a henna tattoo when you're on vacation or before a fun event may be tempting. After all, it's not like it's a permanent tattoo. In fact, you don't even have to be on vacation in a tropical location to get a henna tattoo. Many drug stores sell henna body art kits that allow your teen to create a henna tattoo from the comfort of your own home. Kits contain henna paste and teens can apply their tattoos themselves. While it may seem like a temporary tattoo is harmless fun—after all, henna is often advertised as natural—there are some potential risks involved. Educate yourself about those risks before letting your teen get a henna tattoo. Henna is a small flowering shrub. Henna leaves are dried and turned into a fine powder. That powder can be used to dye hair or stain the skin temporarily. 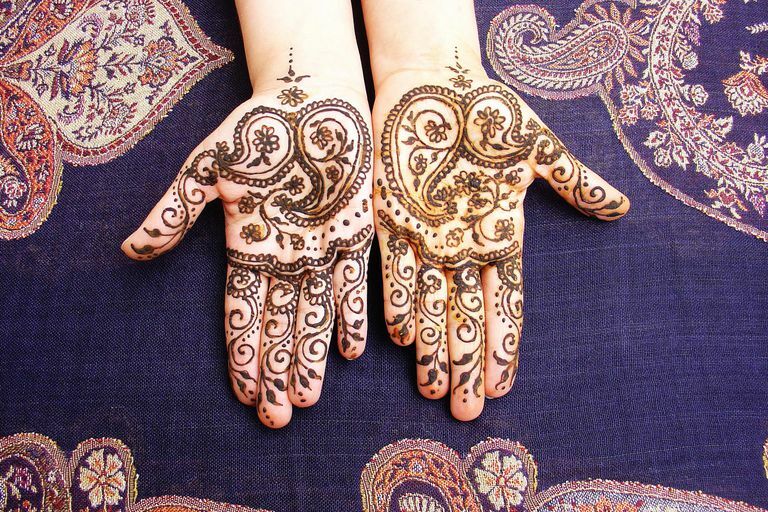 Henna body art has been used to adorn women's bodies in a variety of ceremonies for thousands of years. It's still used in religious ceremonies or worn by brides in weddings in some parts of the world. The tattoos are generally an intricate design. Often, they start on the hand and the design goes up and down both arms. It's important to note that henna tattoos aren't really "tattoos." Henna only stains the skin. A henna tattoo will fade in time, about 2-4 weeks, depending on the type of henna that has been used. It is close to impossible to remove except through natural fading, so if you allow your teen to get a henna tattoo, know that it will be there for a while. Some people say you can speed up the fading by applying hydrogen peroxide to the area daily. But, the results on that are fairly mixed. The FDA has not yet approved henna for a skin dye in the United States. It is only approved as a form of hair dye. Of course, that doesn't mean you can't use henna to create tattoos. Henna tattoos are readily available at fairgrounds, drug stores, and other shops. The FDA has warned that some people experience serious skin reactions when a henna tattoo is applied. According to the FDA's website, "reported problems include redness, blisters, raised red weeping lesions, loss of pigmentation, increased sensitivity to sunlight, and even permanent scarring." It's also important to note that some stains are sold as henna. They often come in bright colors, like blue, green, yellow, or purple. But true henna is an orange, red, or brown color. It's unclear how these stains may affect the skin and the quality of the materials used in stains is likely to vary greatly. Henna can be dangerous to people with a G6PD deficiency, a condition where the body doesn't have enough of the enzyme glucose-6-phosphate dehydrogenase, which helps red blood cells function. If your teen has a G6PD deficiency, you may not know it. Many people don't have any symptoms until their red blood cells are exposed to certain triggers. For some, henna can be a trigger, causing a breakdown in red blood cells, resulting in a variety of medical complications. It's a genetic condition that is passed along from one or both parents. It's most common in males. Those with African heritage are affected most often, but It can also be common among individuals with Greek, Italian, Arabic, and Sephardic Jewish backgrounds. Most henna tattoo artists don't require parental permission and most will place body art on children of all ages. So it's important to talk to your teen about any concerns or rules you may have before your teen walks past a shop and decides to get a henna tattoo on her own. So while you might admit henna tattoos are fun and they look pretty, warn your teen that serious skin reactions can occur. If your teen is going to get a tattoo, conduct a small skin test first. Then, you'll be able to see whether your teen might have an allergic reaction. Lazzatto L, Nannelli C, Notaro R. Glucose-6-Phosphate Dehydrogenase Deficiency. Hematology/Oncology Clinics of North America. 2016;30(2):373-393. Thobile W, Nikosi A.N., Combrinck S., Viljoen A., Cartwright-Jones C. Rapid analysis of the skin irritant p-phenylenediamine (PPD) in henna products using atmospheric solids analysis probe mass spectrometry. Journal of Pharmaceutical and Biomedical Analysis. 2016(128):119-125. U.S. Food and Drug Administration: Temporary Tattoos May Put You At Risk. Should Your Child Start Using Deodorant? Is 12-Years-Old too Young to Start Dating?